Do you need help finding the contactless card technology that is right for your organization? Our trained experts are available to help you order contactless cards & credentials, regardless of the access control system or vendor you currently use. After we determine what type of cards your access control system uses, we can offer a quote as well as offer possible options to help you save money or perhaps enhance your current solution. We can provide sample cards and fobs to ensure absolute compatibility. 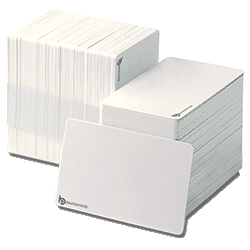 For organizations still wanting straightforward proximity cards for access control and identification, we offer a full line of cost-effective 125 kHz proximity cards, as HID-compatible cards. With the availability of printable ISO-certified proximity cards, clamshell prox cards, key fobs, prox wristbands, adhesive prox tags, sticky discs, and more, it’s very easy for us to find the right solution for your unique identification needs. We offer a vast array of bit formats, too, including HID Corporate 1000, with over 40 types available from trusted card manufacturers. All of our proximity contactless cards come with a standard lifetime warranty. In addition to our own BadgePass contactless smart cards, we also offer other popular open smart card technologies for those who want to use a standard brand or technology they already trust. These include MIFARE Classic cards, HID iCLASS® cards, the new HID iCLASS® Seos™ cards, and others, for physical and logical access control, transit applications, identity verification, and more. We also offer the related hardware and software applications necessary for reading/encoding, issuance and tracking of these cards. Though not an actual card, containing an internal MIFARE or proximity chip allows contactless wristbands to perform the exact same functions as a prox or MIFARE card. Our wristbands can be a direct replacement for access cards or a complementary solution to an existing access control program. 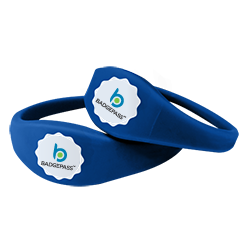 Our wristbands are durable, flexible, and available in a variety of popular colors. They can also be custom printed with your organization’s logo on them. 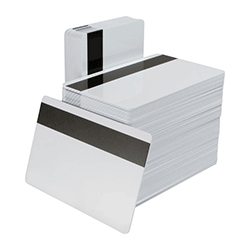 Their convenience and wearability reduces the risk of lost or damaged cards, and increases their likelihood of use, especially on college campuses. Most commonly used in the college and university and hospitality/gaming markets, magstripe cards allow users to encode tracks with important data, such as ID number and/or lost card code. We also offer related hardware and software applications necessary for reading and encoding these cards.